The Howard Law Firm, P.A., in Greenville, South Carolina, offers people the experienced help they need when facing family law matters such as divorce, serious personal injury and workplace accidents. I am attorney Chip Howard, founding attorney of the Howard Law Firm, P.A. I established my practice with the mission of providing the people of the Greenville area with highly effective legal representation and exceptional personal service. I grew up in Moonville and have spent my life in this area. I am committed to helping the people here when they are facing challenging legal situations. My commitment to giving back to this community has helped me realize the two most important aspects of quality legal representation: results and respect. People deserve the best chance at securing the outcomes they need to the legal challenges they are facing. People also deserve to be treated with respect. The legal process can be stressful because most people have not been through it before. I work to help my clients understand what they will be going through and how we can achieve their goals. I work hard to give my clients the results they need while trying to help them find peace of mind and confidence about the outcome. I am here for you when you are facing a difficult situation involving family law, divorce, serious injury or workplace accidents. 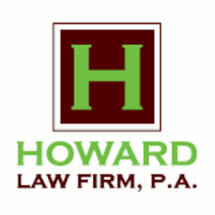 Turn to the Howard Law Firm, P.A., for representation that is committed to you. Call 864-832-2015 or contact my office online to schedule a free initial consultation.